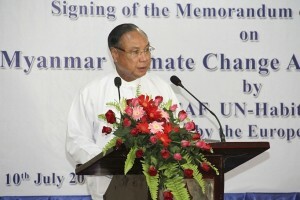 A Memorandum of Understanding was signed today at Amara Hotel in Nay Pyi Taw by the Ministry of Environmental Conservation and Forestry (MOECAF), the United Nations Environment Programme (UNEP) and the United Nations Human Settlements Programme (UN-Habitat) to formalize their collaboration in the field of environment and climate change in Myanmar. Increasing temperatures resulting in droughts, erratic rainfall patterns and extreme weather events such as cyclones and flash floods are some of the effects of climate change that Myanmar is already facing today. A comprehensive national response mechanism is required to increase the country’s level of preparedness in tackling climate change as its impacts intensify. 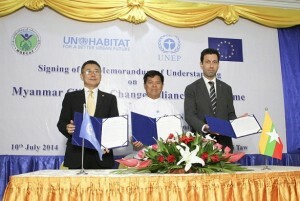 The signed agreement lays the foundation for cooperation between the Government of Myanmar, UNEP and UN-Habitat towards the implementation of the Myanmar Climate Change Alliance (MCCA) programme, which aims to build capacity to integrate climate change considerations into policies, and develop the National Climate Change Strategy and Sector Action Plans in Myanmar. “The impacts of climate change are here and now in the present and are likely to become more severe in the future. These impacts threaten both the progress towards the Millennium Development Goals Myanmar has made in the last few years and also the rapid economic growth the country is currently experien cing.” said Mr Yoshinobu Fukasawa, UN-Habitat’s Regional Director for Asia and the Pacific. 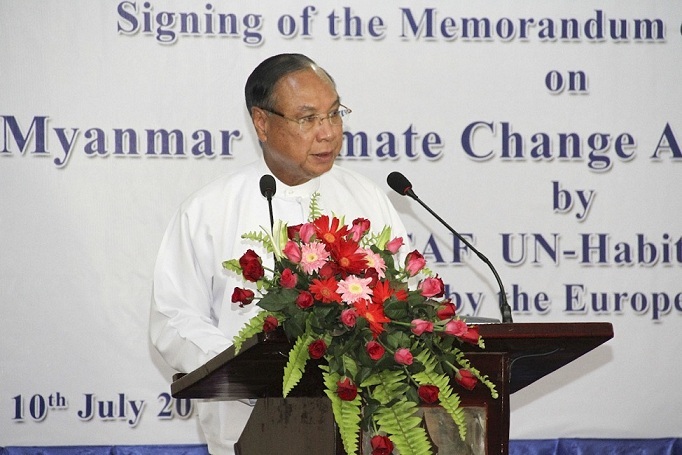 The new agreement reflects the institutions’ shared priorities in mainstreaming climate change into the Myanmar policy development and reform agenda. The three key areas of cooperation are: to raise awareness of key climate change actors: government, civil society, academia and the private sector to address climate change; support bottom-up planning processes for the integration of climate change, facilitated by enhancing capacity and strengthening the national coordination mechanism, which will lead to the development of the National Climate Change Strategy and Sector Action Plans; and learning by doing through pilot demonstration of activities that will build resilience to climate change in the coastal or delta region. “Through this collaboration, the United Nations will bring its collective strength to support Myanmar to plan for and deal with the impacts of climate change. 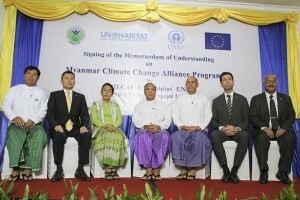 We will provide expertise to support Myanmar in integrating climate change into its sectoral policies and investments, to identify and deploy the best climate technologies and to value and use its ecosystems to increase resilience,” said Mr Kaveh Zahedi, UNEP’s Regional Director & Representative for Asia and the Pacific. The European Union has provided €4 million to support the implementat ion of the four year programme of the MCCA under the Global Climate Change Alliance mechanism that has provided funding support to over 35 countries in four regions worldwide. MOECAF is the lead government agency, while UN-Habitat and UNEP are the implementing partners. The programme will work closely with several other ministries and government agencies in formulating the National Strategy on Climate Change and mainstreaming climate change into Sector Action Plans.